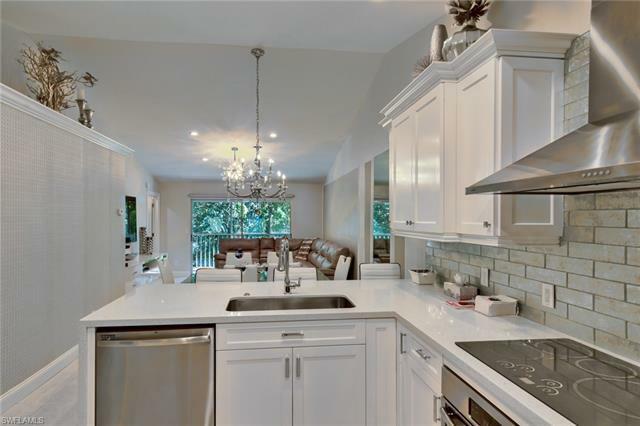 WOW, this impressive and beautifully renovated condo is like new and barely used! The end unit condo with vaulted ceilings was completely updated in 2016 from floor to ceiling! Just minutes from Naples white sandy beaches, 5th Ave, shopping and dining this 3/2 2nd floor end unit was fully upgraded in 2016. Upgrades include new floors, furniture, tile backsplash, wood cabinets, granite countertops, stainless appliances, A/C, hot water heater, new bathrooms, bathroom fixtures and cabinets, dishwasher, dryer, crown molding, and complete with stunning light fixtures and roll down shutters! This is a must see, move in ready condo in the heart of Naples.